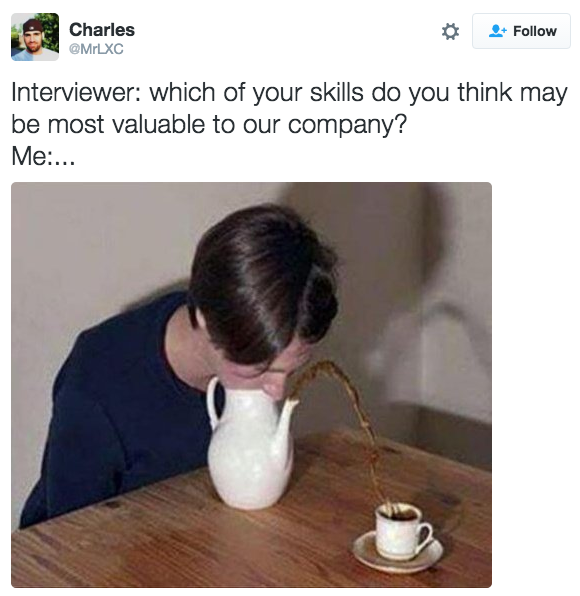 Image text: "Interviewer: which of your skills do you think may be most valuable to our company? Me:..." and then an image of someone using their face to plug the top opening of a teapot, causing the tea to shoot out the spout, landing perfectly in a cup. Image source. In school, I always got good grades, I was at the top of my class, I earned all sorts of awards for being the best. And I based a lot of my identity in that. I am good because my teachers say I am good. Because I got the highest score on this test. Because I was invited to a field trip just for the "gifted" kids. Then in college I started doing job interviews for summer internships and such, and most of the time I didn't get offered a job. And I didn't know how to deal with that. An authority figure is telling me I'm not good enough- and that means I should feel ashamed, it means I'm not smart and I'm not talented, right? No, it doesn't mean anything like that at all. It just means that the company chose not to hire me. Maybe they hired someone else, or maybe they changed their minds and decided not to hire anyone at all. Maybe they chose someone else who has a certain specific skill I don't have- that doesn't mean that I'm not smart; it just means I don't have this one specific skill that the company needed. So what? That doesn't have any relation at all to my worth as a person, or to the question of whether or not I'm good at things. The interviewer comes into it with the goal of finding a person who would be good at some certain position in their company. That's their goal. That's it. They're not there to be an omniscient, impartial judge, giving out awards to candidates who are the best and most talented based on some grand, universal, objective criteria. No. Nothing like that at all. They are just trying to find the person they need for their specific job opening. That's it. And it's totally fine if that's not you. That doesn't mean there's anything wrong with you. The interviewer is not there to tell you if you are good or bad. They are just trying to find a person who would work well in a certain position at their company. That's all. So in a job interview, the interviewer will ask you a bunch of questions. I naively believed that the goal would be to answer all the questions correctly. You know, like in school. Ha. Nope. Nope, not even close. The point is not to answer the questions correctly. The point is to give the interviewer the impression that you are a skilled person who would be great to have in their company. So when they ask you a question, don't answer the actual question that they asked- instead, you need to say something that, first and foremost, will make you come across as a skilled and likable person, AND ALSO can be [loosely] interpreted as an answer to the question they asked. I'll give you an example: Suppose the interviewer asks, "What is your biggest strength?" Maybe your biggest strength is that you can whistle the Sesame Street theme song 100% flawlessly. Perhaps you are literally the best in the world at it. Nobody can whistle the Sesame Street theme song like you. However, this unique talent of yours doesn't really pay, so you are applying for an IT job. So when they ask, "What is your biggest strength?" you should not be actually answering the question "What is your biggest strength?" The interviewer doesn't care about your whistling abilities; that's not relevant to the job you are applying for. Instead, the question you need to answer is this: "What is a strength that you have that shows you would do a good job if you were working here?" And let's talk about the "weakness" question. One time, I was reading a post on the internet that said, "I was interviewing someone and asked the 'what is your biggest weakness' question, and he said 'hygiene' and told me all about how he doesn't shower very much and everyone thinks he smells bad- wow I cannot believe he said that! That was the worst interview I've ever done!" And I was reading this post, so totally confused. Like, they asked what this guy's biggest weakness was, and he answered the question honestly. Why does this internet poster have a problem with that? I mean, you're asking someone about their weaknesses, you gotta expect they're going to tell you something bad... right? See here's the thing: When they ask "What is your biggest weakness?" you're not supposed to actually say what your biggest weakness is. You're supposed to tell them about something that's not really that bad, but could be kinda-sorta classified as a weakness, and talk about how you are learning from your mistakes and improving and it's not really that much of a problem any more. See what I mean? The point is not to answer the question they asked; the point is to say something that makes you look like you are a skilled and competent employee, and also can be kinda-sorta loosely construed as an answer to what they asked. In reality, the interviewer doesn't care about the specific questions either. Their main objective is to find out what kind of person you are and whether or not you would be good at their company, and the questions they ask are a tool to do that. They're not going to hold it against you if the answer you gave didn't really answer the exact question they asked. Please note that the interviewer's objective is COMPLETELY DIFFERENT than that of a teacher giving a test in school. The teacher knows the correct answer and is testing if you know it too. The interviewer doesn't know anything about you and is asking questions which they believe are likely to give useful information about what kind of person you are- but it may be the case that a slightly different variation of their question would actually yield more useful information. That's fine. Go ahead and answer the slightly different question. Here's an example: Maybe the interviewer says, "Tell me about a group project you worked on at your previous job, and what you learned from working in a group." Now suppose you have a really good example of a group project you did, but it was a volunteer thing and wasn't related to your job at all. THAT'S FINE. You just say, "Well I have an example that's not from my job, it was from a volunteer project" and then talk about that. And the interviewer will be fine with it. Even though a correct answer to the question that was asked MUST be from your experience with your previous job at Company XYZ, that doesn't matter. The specific question that was asked doesn't matter. The point is just to say something that makes you look good and is related to the general topic of the question that was asked. The answers you give have to be honest, in the sense that everything you say about yourself must be true. But not in the sense that everything you say is truly the most correct answer to the questions the interviewer asked. They ask you questions, but don't be fooled- giving correct answers to their questions is not actually your primary goal. Instead, you are trying to give the interviewer the impression that you are a good employee and they should hire you. Take those facts about why you are a good employee, and format them in a way that they can be interpreted as answers to the questions the interviewer asks. The concept of a job interview is a totally different thing that what I had always assumed it was. It's not an authority figure making judgments on whether you are talented or not, based on how well you're able to correctly answer their questions. No, nothing like that at all. It's a person who is looking for someone to fill a certain role in their company, and they want to know what kind of employee you are because they don't know anything about you at all. They're not judging if you're "good" or "bad"; they just want to know if you can do the job they need someone to do. And doing well in an interview doesn't mean answering all the questions correctly; it means communicating that you are a skilled person who would be good to have at their company.